We’d love your help. Let us know what’s wrong with this preview of Landslide by Melissa Leet. This is a quiet gem of a book that holds you close until the very end. And when I closed the book I found myself sad to see the characters leave my life. An open hearted lovely read. An emotional read filled with a few smiles and a lot of tears. The imagery and emotions evoked by Leet's words made me feel as if I were there in the Garden myself. The bonds between the characters, the love, the hardships, the loss... all beautifully written. The only (minor) complaint I have is that the story jumps from present-day to the past and vice versa. At times it left me feeling a little disjointed. 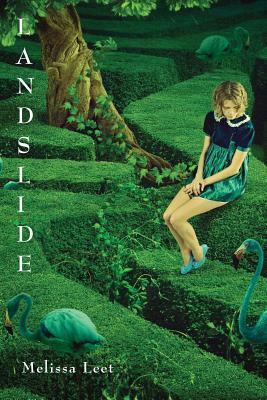 Landslide was a very enjoyable book with a interesting ending. I really liked this book. The vivid imagery of this book draws you in and keeps you engaged. I often read it while commuting on public transportation - which I had to stop doing because I kept missing my exits! The stories within stories are highly developed without being overwhelming. The characters are realistic, relatable, and therefore lovable. Melissa’s command of language, knowledge of specifics, and understanding of the human condition are impressive. I can not recommend this book highly enough! Thank you so much for the book! Melissa Leet, you are an amazing writer. Each time I read passages detailing the gardens I felt I was sitting right there. The friendship between the girls who grew up together was amazing. There was heartbreak and sadness but they were committed to one another. I will definently recommend this book to my friends. I will be watching for other books by this author. Heartbreaking loss, sadness, grief, trust, guilt, friendship, love and hope - who can not relate to any of these themes. Through it all there is the sanctuary of a garden so unique and so vivid I can smell it. Of course, let's not forget a friendship so prevailing to see Jill and Susie through it all and the sensitivity and humor of Giovanni!! Oh Goivanni...could we get more of him please? Perhaps in an upcoming sequel with Susie or a novella perhaps? First, many thanks to Melissa Leet who gifted me this book in a Goodreads giveaway. This was a good book with well drawn characters. Although a little slow, eventually the looks at our main characters past very much informs how she is living out her present. But what really impressed me in this book is the way it shows real, true, and authentic grieving. This is not a sad book; it doesn't go out of its way to make you cry. But the characters within it experience tragedy. And they face that tragedy First, many thanks to Melissa Leet who gifted me this book in a Goodreads giveaway. But what really impressed me in this book is the way it shows real, true, and authentic grieving. This is not a sad book; it doesn't go out of its way to make you cry. But the characters within it experience tragedy. And they face that tragedy and grief in ways that are powerful and real. They acknowledge that sometimes you don't "get over" grief. You just learn a new normal. They acknowledge how long grief can cling... even while eventually moving the characters to a place of joy. I won this book from the giveaway section of Goodreads. My gripe with the novel is the way the author has chapters that go back and forth through Jill's 10-15 years of life through Jill's 24-30 years of life. Maybe the chapters should have been labeled Jill's younger life and Jill's older life. Or perhaps the author did the chapters the way she did so that the reader would feel little landslides along the way. I love this challenge of reading this book. Page 391 "We have to be open to what life brings us" is what this book is all about you can plan your life all you want ,but sometimes you get a better life than what you ever dreamed of having. Landslide is riveting storytelling, full of characters that linger...including the setting which is a lush and provocative character in and of itself. Highly recommended. Born and raised outside of San Francisco, Melissa Leet currently lives in Chicago with her husband Ken, her youngest son James, and their lovely Golden Retriever Neo. Her older children, Christopher, Dillon and William, are scattered across the U.S., attending university. When not in Chicago, Melissa is often out in the Wyoming wilds, listening to the quiet. Prior to living in Chicago, Melissa res Born and raised outside of San Francisco, Melissa Leet currently lives in Chicago with her husband Ken, her youngest son James, and their lovely Golden Retriever Neo. Her older children, Christopher, Dillon and William, are scattered across the U.S., attending university. When not in Chicago, Melissa is often out in the Wyoming wilds, listening to the quiet. Prior to living in Chicago, Melissa resided in London, and for shorter times, in Paris and Madrid. She loves geography, history and speaking other languages. Melissa holds a BA from Smith College, an MBA from Columbia University, and an MA from the School of Oriental and African Studies (SOAS), University of London. She is founder of Chinafolio, a think tank which conducts research on China.